I’m one of those people born with a wandering spirit. I often find myself glancing longingly at the interstate ramp when I’ve been homebound too long. I love the ‘wind in my hair’ feeling of getting out on the road and seeing places I’ve never seen before. For years I waited until I had someone to go with me, hesitant to travel alone. Then I decided that was enough – no more waiting! That meant I had to get over my hesitation and head out solo. At this point I’ve done lots of different solo trips, including everything from catching a hockey game, to an open destination weekend, to a week in London. When I talk about my trips I am often surprised by the number of people who say they can’t imagine traveling alone. Like I told them I travel outside the Milky Way, not to the next state. Personally, I can’t imagine not doing it. The other option is to stay home and continue glancing longingly at interstate ramps. Ummmm….no, thank you. Someone asked me recently if I get scared traveling by myself. I thought about this for a while. The truth is yes, a few times I have been but I make an effort to travel smart. These are a few tips I gave her if she decided to venture out on her own. 1. Avoid that “deer in the headlights” look. I am a strong believer that if someone is looking for a target, the person wandering around looking lost makes an awfully easy mark. I know you’re wondering how you can possibly look like anything else when you’re in a place you’ve never been. You don’t have a clue where anything is! Maybe you’re doing things you’ve never done before, like hailing a cab or just walking streets you’ve never navigated before. I’ve been there! I don’t always do planning for my trips, but usually with something new I try to do at least a little research. For example, before going to London I did an exorbitant amount of research on the tube (their subway system). I had a little notebook where I kept notes like what card I needed to buy and what stops go where I wanted to be. I took it with me everywhere. They also offered pocket sized layouts of the tube system that allowed me to keep up with where I was and when I needed to switch trains or get off. Boston on the other hand, didn’t offer the pocket reference guide so while I did use the giant diagrams they have posted, I also kept a picture of it on my phone. Technology is a fabulous thing for solo travelers! Walking the streets of Boston, I obviously didn’t have a clue where anything was but I didn’t want to bumble around looking lost. I downloaded Google Maps onto my cell phone, which gave walking directions to any address I needed. I was able to roam around without hesitation like I did it every day! I’ll tell you all about the ridiculous selfies I take when I’m out and about at some point. 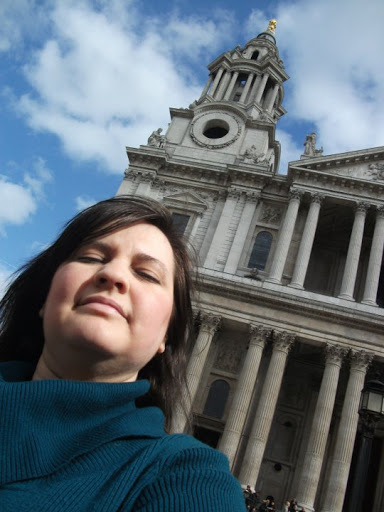 This is me in front of St. Paul’s Cathedral in London. 2. Always be aware of your surroundings, and those who surround you. It’s easy to get caught up in all the new sights on the road. Whether it’s giant skyscrapers, historical monuments, or rolling hills, the new sights can be distracting. I always remind myself to pay attention to the people and things around me. This doesn’t mean I shoot death rays at everyone who comes within 5 feet of me. There’s no need to be paranoid or crazy. I just pay attention. I trust my instincts. If someone acts strangely or stands too close (and that has happened before), I pay extra attention and act accordingly. One trip I wore a backpack and had a guy stand unusually close behind me while waiting in a line. I noticed anytime I would move, he would move as well. This was a little creepy. The way I dealt with it was without confrontation. I just kept readjusting, facing other directions. When I checked out, I quickly left the store and went to find a bench to sit instead of going to my next destination. I did this to make sure he didn’t follow me. There were people everywhere so I was pretty confident I would be safe on that bench. When I decided the coast was clear and I felt safe again, I headed off on the rest of my day. 3. Act like a teenager again! Well, not in a super fun way where your bills disappear and you can eat whatever you want without consequence. When I’m in my hometown I go where I want, when I want. I know where I am, where I’m going, and where to avoid. That’s not the case when I’m on the road, which has the potential to put me in a dangerous situation when I’m alone. I usually try to make it back to my hotel room before it gets too late. This is just a “better safe than sorry” tactic of mine. I do occasionally break this rule, if I have a good reason like taking in a show. Most of the time I just use as much of the daylight as I can (sorry, night owls!) and make my way back to my room when the sun starts setting. 4. Keep your money on you and out of sight. When I travel, first of all, I never keep my entire stash of money on me. Typically, I carry my debit card and enough cash to get me through that day. The rest is hidden in my hotel room. When I have to pay for something if I can pull one $20 bill (for example) instead of all the money I’m carrying, I do that. If not, I keep it as concealed as I can in my hand. When I’m done, I quickly shove it back in my pocket. This may seem obvious, but I also would not count or organize my money in public. If you have to, do it in a bathroom stall. Anywhere you won’t make a spectacle of yourself and all your riches. I always have a travel buddy, even when I travel alone. Personally, I don’t normally have an itinerary and even when I do, I rarely stick with it. However, I make sure there is someone who knows what I am doing every day – where I plan on going and how I plan on getting there. It may just be a simple text, ‘Hey, today I think I’m going to these places: blah,blah, and blah.’ or even better, sending a text each time I head somewhere new. Hopefully these will never be needed for anything other than conversation but if something unexpected did happen, you want someone to know where you might be. Once I ordered my dinner to be delivered (it was after dark!). Upon learning this my mother insisted I tell her where I ordered from and let her know as soon as I’d locked my room door behind me after the food was received. I honestly thought this was whackadoo but she freaked me out enough to go along with it. 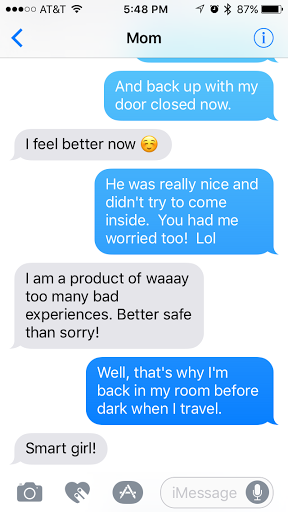 Delivery was uneventful, but the next night when I did the same thing my delivery guy was arguing with a passerby when I came to the door. There was one moment the passerby walked up aggressively when I thought, “If that guy had a gun, I’d be dead right now.” Quite a sobering thought. After everything calmed down and I got my food, I was visibly shaken and could only think about what could have happened….and that I hadn’t told my mother that night about the delivery. This is the night of the first delivery, when I still thought my mother was whackadoo! What I want you to take away from this is that, while it does make sense to take a few extra precautions, solo travel is absolutely “doable”! Some of the best trips I’ve been on were done alone. In fact, I think everyone should take at least one trip alone at some point! Have you been on a solo trip? Do you have tips I didn’t mention here? Let me know you’re here!